Catalog Page 57. Teddy bear doctor and nurse scrubs, vests and capes. 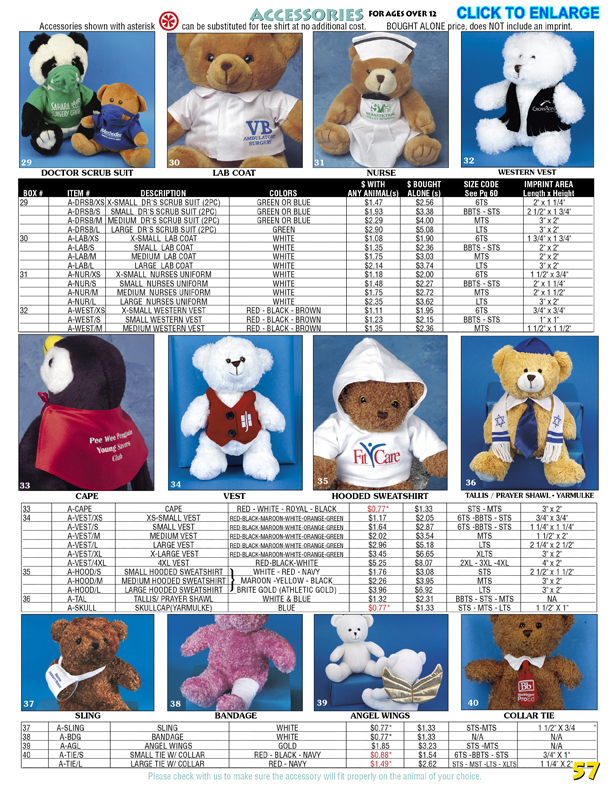 Catalog Page 58. Choose from assorted accessories including collar ties, angel wings, capes, vests, doctor and nurse scrubs, lab coat, hospital sling, bandage, sweatshirt hoodie, prayer shawl, west vest and many other accessories. The red price indicated the price when purchased with an animal. We can print your logo onto many of the accessories. Use accessories to theme your event or promotion. Angel wings for the Christmas season and doctor and nurse scrubs for hospital and medical office giveaways.